Overall I’m very pleased with the iClever BTS09 and have no hesitation in recommending it. It has excellent sound quality and battery life and has a unique, stylish form factor that makes it work in any room or even in an office space. With easy-to-use controls and phone compatibility to service as a speakerphone, it is versatile to meet your needs at work or home. connects to your phone or tablet via Bluetooth 4.2 LE. It can also be connected via an AUX port or in a MicroSD slot from which you can play pre-loaded music. Built into the speaker is a 4000mAh battery that is recharged via a MicroUSB port. Charging time takes about 2 hours while play time is rated at 8 hours. The BTS09 is unique in its form factor. It is dominated by the aluminum grille that houses the two 10W speakers. The speaker housing is connected to an aluminum base which gives the entire speaker a sleek, modern look. 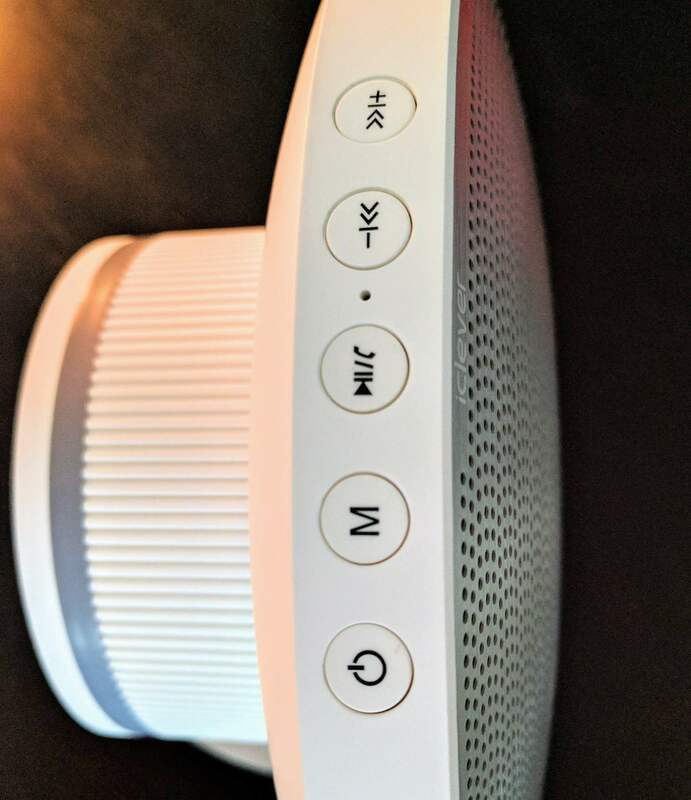 On the top edge of the speaker you will find the various buttons that control it such as the volume up/down buttons, the mode button and the power button. Like other iClever speakers, these buttons are multi-modal meaning the do different things when long pressed. I’ll cover the these various controls in the next section of the review. Turning the speaker over, you will find the MicroUSB charging port, the MicroSD card slot and the 3.5mm Auxiliary port. Finally, around the back edge of the speaker section, you will find an LED ring. This ring, which is enabled by pressing the power button after the speaker is turned on, provides a bit of backlight to the speaker for aesthetics. iClever designed this speaker to not be hidden away but rather to be out and in a room. It is as much art as it is utilitarian which I personally like about it. Many speakers look the same and frankly, you kind of want to tuck them away from view. That’s not the case with the BTS09. The iClever BTS09 supports Bluetooth 4.2 so you have up to 10 meters (roughly 30 feet) of maximum distance between your phone and the speaker in order for connectivity to be maintained. 4.2 also is a lower power consumption on the speaker for longer battery life. Pairing the BTS09 to your phone is straightforward. Press and hold the power button for 2 seconds. You will hear an audible tone and the blue indicator light within the grille of the speaker will start to flash. This is your indicator that the speaker is ready to be paired. Next, on your phone or tablet, go to the Bluetooth settings and look for “IC-BTS09” amongst the available devices. Tapping it will start the pairing process automatically. If you are prompted for a PIN for the speaker, enter 0000 (four zeros). Once pairing is completed successfully, you will hear another audible tone and the blue indicator light will light steadily. Like other iClever Bluetooth speakers, the company has provided a set of multifunctional controls for you to control your music experience. The volume up and down buttons do as advertised but also can go to the next or previous track with a short press. Likewise, the MFB (Multi-Function Button) does several things. It can disconnect your Bluetooth devices with a long press, a double press can redial the last number you dialed on your phone so it can act like a conference room speaker, and a short press will pause/play your music. Interestingly, this button can also work during your phone conversations too. When you have a call incoming, pressing the MFB will answer the call while a long press will reject the call. If you are on a call, you can short press the MFB to hang up the call. How much you will use these buttons on the BTS09 is really going to depend on your proximity to the speaker. In my family room, where I have this speaker, I or my wife are often on the sofa and not near where the speaker lives. In that case, I control the music using Google Play Music and the volume buttons on my Pixel XL. While I did test call quality for this review – and it was great – I’ve not used the phone functions in my day-to-day use of this speaker. 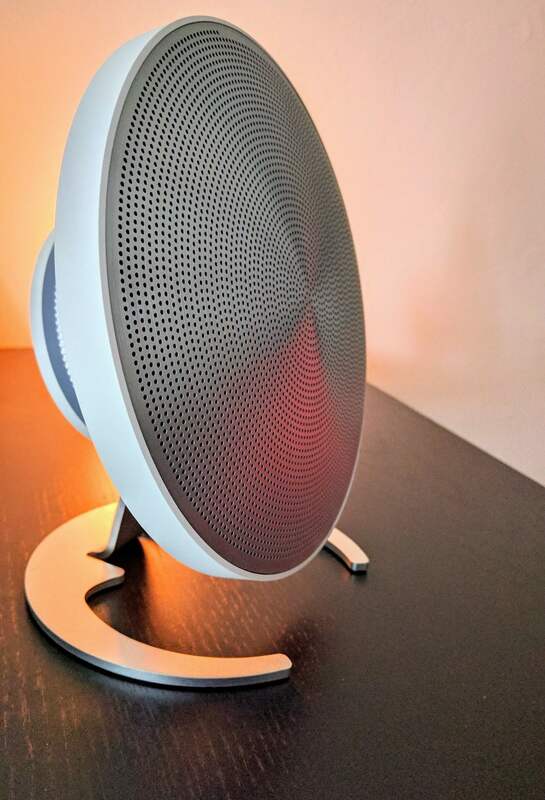 Given its styling, it certainly could serve as a conference room/huddle room speaker for calls should a company want to invest in a few of them. One of the aspects of iClever Bluetooth speakers I have always appreciated is their sound quality. The BTS09 is no different. Unlike other speakers, especially those in the sub-$100 price range, iClever speakers never sound “tinny”. They always have a rich, warm sound with plenty of bass but not overly so. Equally, they sound great regardless of the genre of music you are listening to at the time. For this review, I ran the speaker through a wide range of music genre ranging from metal (Iron Maiden and Pantera), electronica (DeadMau5), rock & pop (Rush and Katy Perry) and classical (Handel and Beethoven mostly). All of them sounded great and thanks to the large speaker grille, filled the room with music nicely. I did notice that on heaver music styles like Iron Maiden, Pantera and Slipknot, the bass was a bit heavy but, to be fair, those genre tend to be bass heavy regardless. iClever states in the documentation for the BTS09 that the 4000mAh battery built into the unit can go up to eight hours between chargers. In my testing, I found that to be mostly accurate. I did two complete day tests of the unit sent to me to see how long it would go throughout the day. In the first test, playing a looping playlist of all of the genres and artists I mentioned above, I achieved 7:42 before the speaker shutdown. For the second test, I played the same playlist and hit 7:38 minutes. I’m more than comfortable with my results versus what iClever rates as most of these static tests for battery life are done in ideal environments. For me to get 7-plus hours between charges is more than enough for me personally. To get more information on the speaker, head over to the iClever store on Amazon. There you can pick up one for $54.99 and it is Amazon Prime eligible for free shipping. iClever backs the speaker up with an 18-month warranty.